Join the San Bernardino County Library System, San Bernardino City Libraries, Colton City Library, Upland City Library, and the Redlands A.K. Smiley Library as we partner with Baker’s Drive-Thru to promote reading among children and teens throughout San Bernardino County. 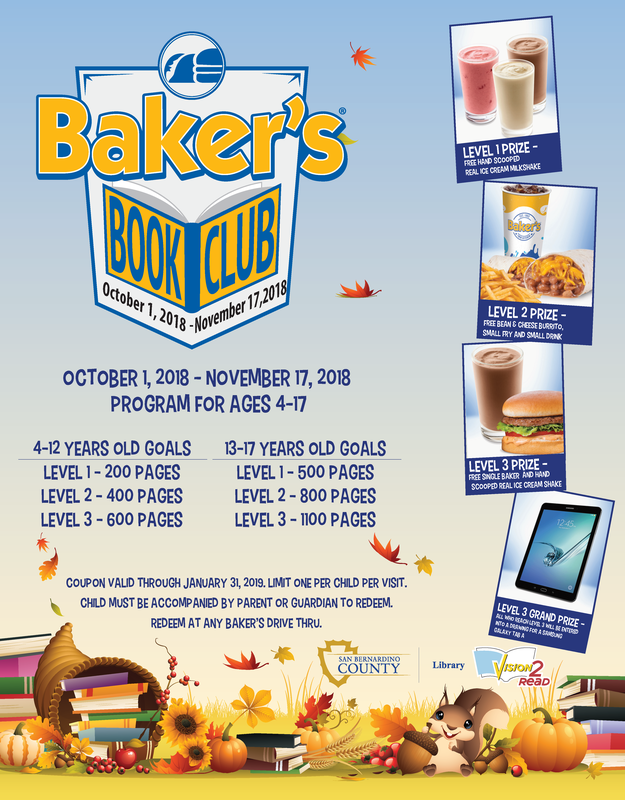 The Baker’s Book Club program is underway through Saturday, Nov. 17. This program encourages students to read in all communities across the county. To participate in this program, visit any of the 32 San Bernardino County Branch Libraries, San Bernardino City Branch Libraries, Colton City Library, Upland City Library, or Redlands A.K. Smiley Library to sign up. Participants must be between the ages of 4 and 17, and a parent or guardian will need to sign to acknowledge reading accomplishments. A voucher for a free Baker’s food item will be issued as reading goals are met. Each child and teen may earn a total of three awards and vouchers for the duration of the program. In support of the Countywide Vision’s Vision2Read literacy campaign, this program will help to improve literacy among children ages 4 to 17, with the help of incentives, by inspiring an excitement to read, providing achievement goals, and encouraging a reading routine.